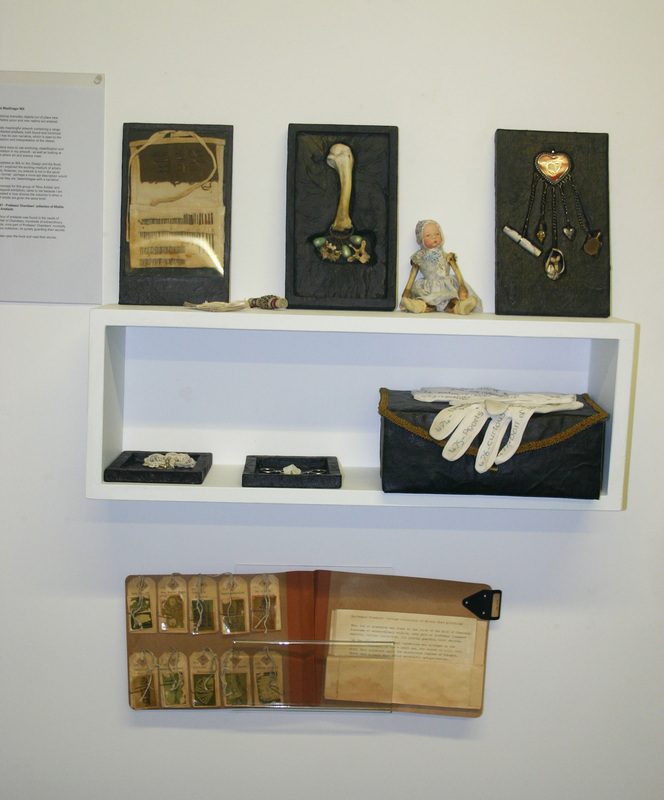 I initiated the idea of this collaborative project, the working title of which was 'Heirloom Box'. Being fascinated by the fact that when a group of artists work on exactly the same brief, they all produce very different work, I decided to set my own brief and enjoy the consequences of the results. Getting a group of nine female artists was obviously the first task, it took a few months of meeting up for preliminary chats before a suitable group was formed and settled down to the task in hand. Nine female artists to work on a project for nine months, creating nine artefacts. By keeping tight restraints on the box and contents we should produce a diverse and cohesive body of work. Imagine you find a small box in the attic, on opening it you discover nine artefacts. Where did they come from - how old are they - who did they belong to - what is their story? This box of artefacts was found in the vaults of ‘The Hall of Chambers’. Hundreds of extraordinary objects, once part of Professor Chambers’ morbidly curious collection, lie quietly guarding their secrets – please open the book and read their stories. Above detail: exhibit 469 - curator gloves - personal item of clothing. The gloves have each artefacts embroidered on the finger tips where they have absorbed the very essence of the collection. exhibit 476 - Curious photographs – a collection of vintage curio photographs. Above detail: exhibit 477 – Doll of Bones – This doll of bones was found in the Sedlec Ossuary, a small Roman Catholic chapel, located beneath the Cemetery Church of All Saints in the Czech Republic. The ossuary is estimated to contain the skeletons of between 40,000 and 70,000 people, whose bones have in many cases been artistically arranged to form decorations and furnishings for the chapel. Above detail: exhibit 471 - Case of ingested needles – These 79 pins and needles were removed from the body of an insane woman, during her life and after her death. From the Warren Museum at the Harvard Medical School. Above detail: exhibit 475 - Mother of Pearl nest – Pearl nursery - an assemblage of vintage pearls mounted on a mother of pearl shell. Above detail: exhibit 470 - Atlantis Sea Mouse eggs - All that remains of: a collection of rare Atlantis Sea Mouse eggs. Originally six eggs were collected, now only two remain, it is not know how the rest of the collection disappeared, seemingly vanishing into thin air one night.